It’s been awhile since I recommended a film here on Bang & Jangle, but I caught one this weekend that deserves a mention. 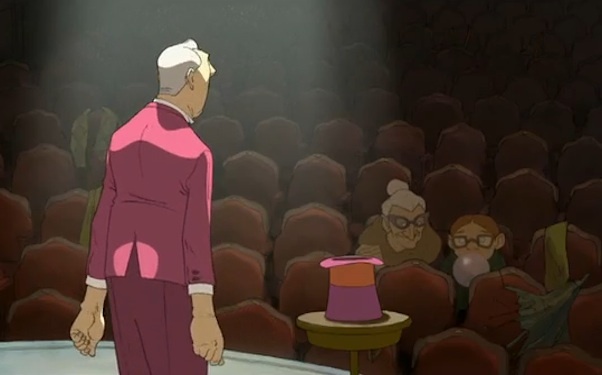 The Illusionist (no relation to the 2006 Edward Norton film) is Sylvain Chomet’s follow-up to The Triplets of Belleville. While the latter arrived with much fanfare, The Illusionist passed much more quietly. That’s a shame, because it’s a beautiful film. Sophisticated animation for adults is rare, so as soon as I caught wind of this one I was eager to see it. The story is simple and concerns a down-at-the-heels magician in 1950’s Scotland. What makes this one even more of a visual feast is that it is virtually wordless, with only incidental comments in English, French, and some Gaelic. What comes across strongly is a keenly perceived sense of movement – the beats in each scene have a distinct musicality. 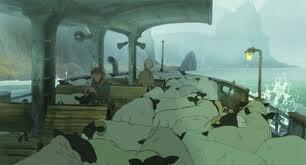 I get the sense that the animators would see a crowded street with different eyes than I do. The exaggerations are subtle and never crude, the framing masterful. The animation also combines the best of new and old-fashioned styles, clean, colourful, and fluid but evoking a bygone era. I appreciated the bleak touches that cut the whimsy whenever it gets too thick. In this cartoon, lonely people drink to excess and clowns attempt suicide. The overall feel is different from The Triplets of Belleville, and I imagine after that film’s success it would have been tempting to develop the kinetic style into a brand. One reason for the difference might be that this film is an adaptation from an unfilmed script by famous French director Jacques Tati. I’ve only seen one Tati film, and awhile ago at that, but I remember the visual and comic sense being very similar. Although there seems to be some conjecture on the subject, the script allegedly represents an attempt by Tati to reconcile with his estranged daughter. Chomet has been criticized for his adaptation, either for being disrespectful towards the family or for inserting maudlin elements into Tati’s vision. I definitely found the plotting to be fairly slight and sometimes sentimental, but never cloying. When a film looks this good, I’m happy to watch characters walk down the street. Chomet claims to be able to relate to the material because he has a daughter from a previous marriage himself whom he does not live with. My only complaint with the treatment would be that towards the end the film seems to veer from its melancholy straight into desolation. I waited for this one for a long time as a fan of both 'Triplets' (that movie makes me giddy just thinking about it) and Tati. Your thoughts pretty much sum up my feelings about it. I clicked on your profile and looked at your list of favorite (or whatever) movies. I'm not sure this has ever happened before, but I love ever movie on that list. I wouldn't call 'Marwencol' one of my favorites exactly, but all of those other ones? Yep. Love Jodorowsky. Love Werner Herzog (have you seen 'Stroszek'? My guess is you would or do love that one!). And I watch 'Lebowski' every year on my birthday. Love the list of musicians, too...anybody who includes Tiny Tim, Spike Jones, The Shaggs, Harry Partch, Tom, Os Mutantes, and Hasil Adkins is automatically going to be my best friend. I hope that's not creepy. 'Bad Lieutenant' is on the blog somewhere. That 'dancing soul' scene is a religious experience. And back to 'Illusionist'/Tati...Tati is one of my favorites. I'd recommend all of his movies as long as you see 'Trafic' last. 'Playtime,' 'M. Hulot's Vacation,' 'Mon Oncle,'...all wonderful. I would think your appreciation of "old-timey" things would give you a head start on Tati. I'm going to check out your music now. Sorry for my verbosity.